There’s no time to procrastinate. As a parent, you tend not to take free time for granted. And that means the moment naptime begins, the writing does too—at least for as long as the baby sleeps—which could mean five minutes or two hours. You never know, so you just get to work. Writer Abroad used to have insane goals for herself when she was writing the first draft of her memoir: about 5,000 words a week, which sometimes was unsustainable. But now, between working part-time and being a mother full-time, the goal for the novel is 1,000 words a week. It’s about the pace that change happens in Switzerland, but at least it’s sustainable. 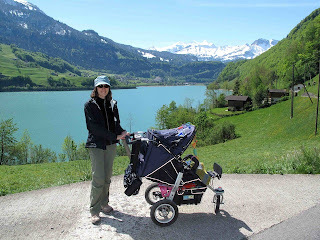 Every Thursday is hike in the woods day with Baby M. Since Baby M likes to sleep during walks, Writer Abroad has a lot of time to think about her writing projects and come up with new ideas and plot twists which never seem to happen when she stares at a computer. Writer Abroad has never been a morning person, but thanks to Baby M, she’s become one. And she’s amazed at how much more time there is in the day when she gets up at 6 a.m.
You learn to work with distraction. Baby M loves her plastic iPod more than any other toy. She flips from The Tales of Hoffman to A Little Night Music to Beethoven’s 5th like a bad TV channel surfer. But as long as the soundtrack is a happy one, Writer Abroad keeps typing. How has having a baby changed your writing? Amen to #1! I feel like I have been able to write more because I KNOW that nap time is the only time to get it done. I heard a rumor that morning started earlier....I would also be more productive if I'd just get up the first time my alarm went off. L. Shanna, I know. Hurrah for naps! The only problem is sometimes I want to take them too. Jenni, yeah morning started for me at 5:30 today. A little too early, if you ask me! I found that having children gives you back some version of the first three years of your own life, which you've of course forgotten. Plus, why whine over a stubborn sentence, when there's the example of your child who keeps falling until he learns how to walk? All good gifts, for any writer. It's also amazing the things to discover all the things we take for granted. That you can't hold water, for example. Baby M really wanted to hold the water at the pool! I used to write like mad during naps. Now I stay up late into the night to write, usually. During school in the fall, too. During my pregnancy I become so lost and forgetful. When I would start to write I would forget what is the topic and structure I wanted to write about :). But there is really strong feeling in me, about getting back my writing skills when baby arrives. That was positive motivator that kicked up my upcoming feelings. Nap time is great! I wrote 1,000 words during one nap last week. It's possible. Coloreyes, don't worry. I actually wrote less when pregnant than with my little baby! All I wanted to do when I was pregnant was swim so I could lose the weight for an hour! how are you ? I've finally entered the blogging world too, and I'm sure it's because now my daughter is born, I don't think about what I will write, and get worried about whether it will be good enough, I don't have time for all of these procrastination activities. As soon as my daughter is sleeping I rush to my laptop, without even making myself a cup of tea! I agree with it and really it exposes our mind with unique creativity.